How old is the switchboard? 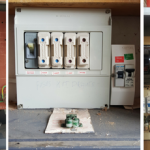 An old switchboard can present varied problems (see our blog post HERE) that can include electrical short circuiting, electrocution and an increased risk of fire. Below is an example of an old switchboard containing ceramic fuses. These older switchboards don’t contain modern circuit breakers or safety switches and are a candidate for replacement. 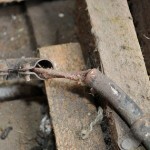 Presenting a real risk for electrocution or fire, these types of old wiring are common in Melbourne homes and indicate the house is in need of rewiring. You can look for this wiring in the roof cavity of the home through the manhole. 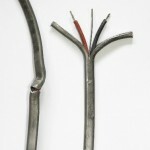 See below examples of what to look for to identify older style wiring. Con-du-what? A conduit is a tube that encases the electrical wiring, and if the home was built during the 1940-50s there is a good chance there will be metal conduits in the electrical system. The conduit runs around the home to all the light fittings and power points from the roof space or possibly under the floor of the house (see below example). 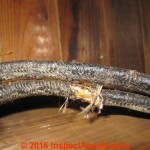 The problem with metal conduits is that if the wires inside deteriorate over time they can become a live electrical hazard. Wooden ducting is another wire encasement variation and offers very little protection as it is fragile and can easily be broken if trodden on. If you are unsure and would like a qualified electrician to complete a pre-purchase Electrical Health Check that goes Above and Beyond just a brief look, contact Captain Electric on 1300 445 996 or visit our website www.captainelectric.com.au (REC 18185).